Lisa Bristol was 28 years old in 1986 when the Space Shuttle Challenger exploded over Cape Canaveral, Florida, just after launch. Bristol’s sister, Christa McAuliffe, was 37 when she died in the disaster. Today, Jan. 28, marks the 30th anniversary of the Challenger tragedy, in which five astronauts and two payload specialists – including McAuliffe – were killed. Although Bristol said her sister’s death weighs heavy in her heart each day, she and her family will mark this anniversary at an event at Framingham State University, McAuliffe’s alma matter and the site of the Challenger Learning Center and McAuliffe Center for Integrated Science Learning. McAuliffe was chosen in 1985 to be the first teacher in space, plucking her from her job at Concord High School in New Hampshire to train with astronauts for the launch into space. Bristol said learning that her sister would head into orbit wasn’t much of a surprise. 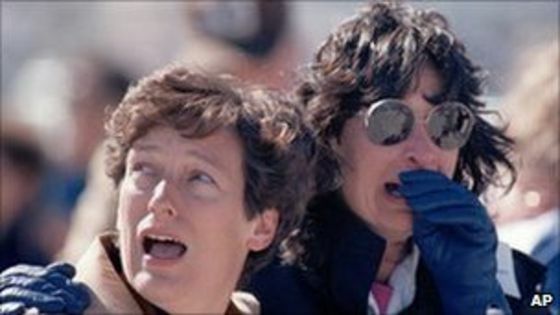 The look of fear on family members tells the sight we all saw on that fateful day. McAuliffe was driven to attempt a space trip because she felt strongly about teaching history through the perspective of the common citizen. According to friend and former director of the McAuliffe Center Mary Liscombe, McAuliffe got the space bug as a freshman in college. She announced she would someday go, at a time when only men were astronauts. Empowering women was one of McAuliffe’s passions, Bristol said, and going to space was just one way she did it. McAuliffe also designed a course about women in history for her students in Concord, Bristol said. She would often teach using the journals of common citizens as text books, believing there was a lot to learn from the lives of the everyday person. In space, McAuliffe planned to keep a journal, marking her space in history. “This is something near and dear to her heart,” Bristol said. “This is why she was going to keep a journal. That was one of her projects.” Bristol said she realized early on that her older sister was extraordinary. That others now know that, Bristol said, is somewhat of a consolation.